These terms and conditions set out our agreement relating to the supply of goods to you by CGQ Snooker. Nothing said by any sales person on behalf of CGQ Snooker should be understood as a variation of these terms and conditions and CGQ Snooker does not accept any liability for any such representations. The CGQ Snooker website is maintained for your personal use and viewing. Access and use of the site means that you accept the following terms and conditions, effective from the date of first use, if you do not accept any of these terms and conditions please do not use our website. You accept and agree not to use the website in any manner that may cause, or is likely to cause, access to the site to be interrupted, damaged or impaired in any way. “CGQ Snooker” is the trading name of CGQ Snooker ltd whose registered office is at 133 Dungannon Road, Cookstown, Tyrone, BT80 9BD. If you change your mind after placing an order, you can cancel it at any time before we dispatch it with the exception of custom made items. Please contact us stating “Order Cancellation” You will need to give us written confirmation of your name, address and your order number to cancel your order. If you cancel part of an order the postage and packaging charge will be recalculated on the price of the goods you keep. Cancelled orders will be refunded in full however this does not include any return shipping costs that you incur. Every effort is made to ensure that the information contained on this website is accurate and up to date. However, we cannot guarantee the liability or accuracy of this information and cannot be held liable for mistakes or omissions. All goods offered via the website are subject to availability. All product images shown are for illustration purposes only. Prices throughout the website are quoted in Pounds Sterling and payment can only be accepted in Pounds Sterling. While we make every effort to ensure that the goods shown on our website are currently available at the price shown, we cannot guarantee this will always be the case. Prices may change and any offers posted on the website may be withdrawn at any time. The price you pay is the price of the goods shown at the time you place your order, even if the price of the goods has changed since. If goods you have ordered are unavailable, you will be notified as soon as possible. If for any reason goods are not available for dispatch within the criteria shown for that particular item, we will contact you and offer you the option of either cancelling and receiving a full refund to your card, or purchasing an alternative product. While we make every effort to ensure deliveries are on time we are not liable for late deliveries caused by our suppliers or their carriers. Prices normally include postage and packing throughout UK and Irelnd (except for remote regions on some items) unless specifically stated. Please ask regarding additional charges to offshore destinations and abroad. We are delighted to answer all enquiries. Delivery to non-European countries may result in import duties payable on receipt of the goods. You will be liable for such duties. Special arrangements are available for British forces serving overseas. We reserve the right to change prices and/or withdraw stock without notice. We will deliver goods to the address specified by you in the order process. Goods will be posted or sent by either standard delivery via Royal Mail or express delivery via courier in accordance with the selection you indicate on the electronic order form. Delivery will be made as soon as possible after your order is accepted and in any event within 30 days of dispatch of the order. All delivery times quoted on the web site are estimates only, based on availability, normal processing and delivery companies. CGQ Snooker cannot be held responsible for failure to deliver the goods if you have supplied us with incorrect information; in circumstance whereby the goods will not fit into a letterbox and the address is unattended; or any other reason once the goods have been dispatched. If goods arrive in a damaged condition, if possible make a note on the consignment note and inform us as soon as possible after the delivery. It is your responsibility to confirm that the correct number of packages, as indicated on the consignment note included with your goods, has been delivered. Any shortages must be noted on the consignment note and it will be your responsibility to notify us via Customer Services within 10 days from delivery. You will become the owner of the goods you have ordered when the goods are dispatched to you from our distribution centre. Any transit damage to the goods, shortages or incorrect goods should be conveyed to us as soon as possible after delivery. From the time of receipted delivery of the goods, any loss or damage to the goods shall be at your own risk. We offer a no-quibble money back guarantee on all purchases. If for whatever reason you wish to return the goods then you may do so within 28 days of purchase for a full refund or exchange as you prefer. This excludes products that have been custom made or personalised for you. CGQ Snooker will not be liable to you for any indirect or consequential loss or damage arising out of any problem relating to goods delivered to you and shall have no liability to pay any compensation other than to refund you the amount paid for the goods upon their return. Please note that nothing contained herein limits any rights you have as a consumer under the laws of Northern Ireland. Nothing in these terms and conditions creates any right which is enforceable by any person who is not a party to the contract between you and CGQ Snooker. CGQ Snooker shall have no liability to you for any failure to deliver the goods you have ordered or for any delay, damage or defect to goods delivered caused by circumstances beyond its reasonable control. If any part of these conditions is unenforceable (including any provision in which CGQ Snooker excludes its liability to you) the enforceability of any other part of these conditions will not be affected. 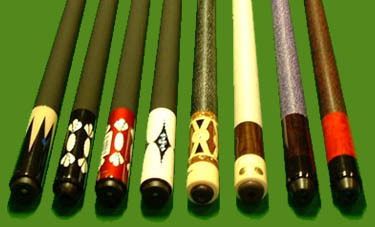 Some products, such as some cue extensions, will only work with specific types of cue. We try to mention a product's compatibility in its description. If you are in any doubt as to whether a cue extension will work with your cue, or have any other compatibility issues, please contact us before you place your order. If you have any questions or comments about these terms and conditions or our website please contact us. All confidential information, including credit card details, are held securely and only transmitted in encrypted form. We do not sell, trade or rent your personal information to others. Customer details are only passed to third parties in order to facilitate completion of the order and are used only in accordance with the Data Protection Act. Unless otherwise stated the intellectual property rights in all the material on this website is the property of CGQ Snooker and its associates. The Contract will be governed by the laws of Northern Ireland and the parties to the Contract submit to the jurisdiction of the Courts.